From the left-side menu, click the Discover option. Explore: You can use the ready icons there to easily access certain categories of your backed up data, such as the images, videos, etc, or to explore everything by clicking the All Categories icon. Devices: This section provides you with a list of the devices (computers and smartphones) that you are backing up. By clicking on the name of any device there, the data which has been backed up from it will be shown. 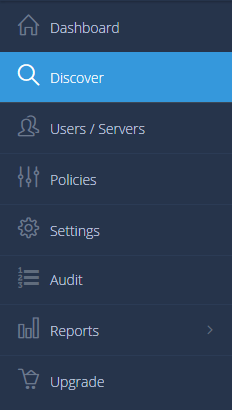 Services: This section provides you with a list of the services which you have connected with your BigMIND account (More info). By clicking the icon of any service there, the files which have been imported from this service will be shown. Top Faces: Since BigMIND has face recognition ability, a list of the most popular faces in your photos will be shown in this section. Latest Documents: This section provides you with a list of the documents which have been uploaded recently. Latest Media: This section provides you with a list of the media files which have been uploaded recently. 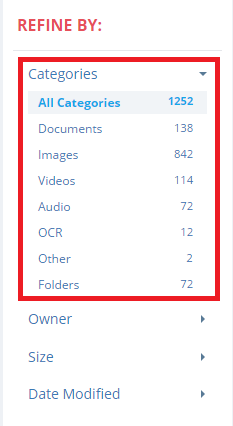 Once you use any of the sections mentioned above to start browsing your data, you can change the view of the files (List view/Grid view) and enable/disable showing the deleted data using the icons at the upper right corner of the page. 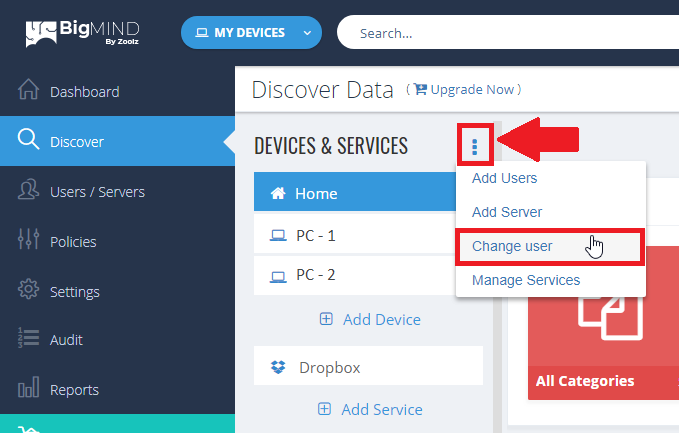 You can also use the left-side panel (Devices & Services) to access the data backed up from a certain computer, server, tablet, mobile or service, by simply clicking on it. To view the data backed up by another user (You should be Admin user to do this), click the Actions icon ( ) placed at the upper right corner of the left-side panel → Select the Change user option → From the Change User box that will open, select the user to browse his/her devices → OK.
To view a certain category of data (Photos, Videos, etc. ), select the wanted category from the Categories under REFINE BY on the left side menu. Here is a list of the extensions supported by BigMIND. 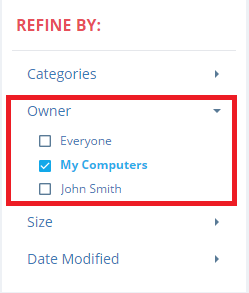 To view certain data based on its owner, select the Owner from the list of owners under REFINE BY on the left side menu. 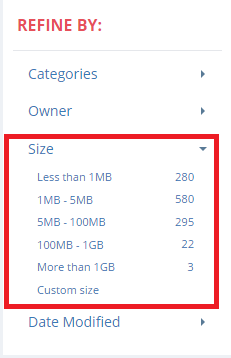 To view certain data based on its size, specify the wanted size from the list of Size under REFINE BY on the left side menu. 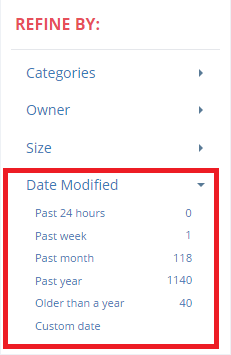 To view certain data based on its date modified, specify the wanted date from the list of Date Modified under REFINE BY on the left side menu. To view full information about a certain file, select it → Click the Info icon for it → Full information about the selected file will be shown on the right side of the page. From the Details view, you can Download , Share , Delete and Tag this selected item. From the Versions view, you can view the versions you have for this selected item. You can select multiple items together. Once selected, you can also Download , Share , Delete and Tag those selected items. 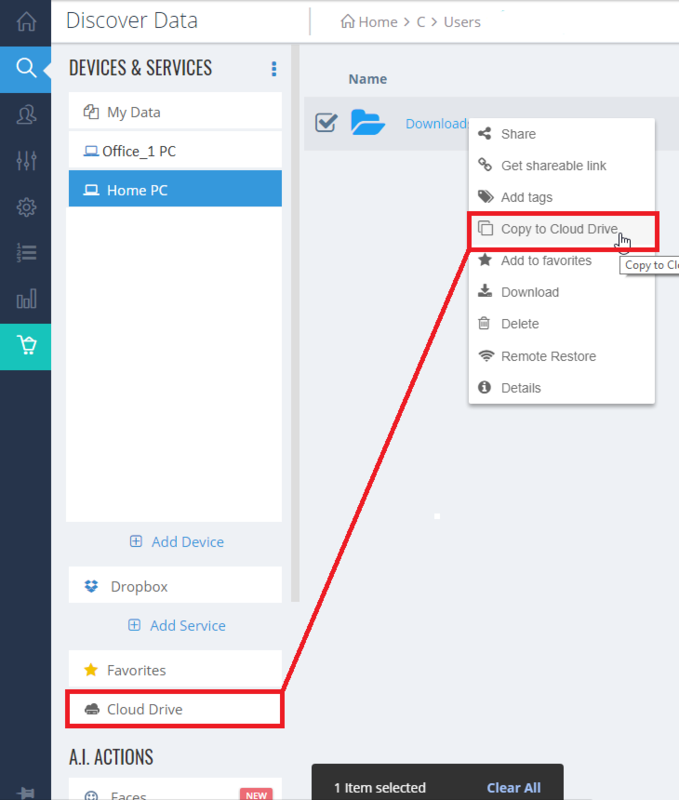 You can move copy files/folders from their current location to your Cloud Drive folder. Just right-click on the wanted item → Copy to Cloud Drive. You can now reach your wanted data quickly and easily, by using the Search function. With our indexing technology, you can now use BigMIND to search by words and phrases inside any document (Instead of only searching for filenames). Our technology has been designed to understand sentence structures and language variations. This means that from any computer or mobile device, you can search any word and BigMIND will display the relevant results like a search engine. BigMIND will extract the paragraph where the search phrase is located, so you can verify which file you wish to access. our indexing technology supports 22 languages.